The Vault consulting firms ranking is undoubtedly the best known and most publicized in the consulting sector. This ranking has existed for over 10 years and has grown over the years. It is possible to have rankings according to geographical areas, like in Europe or in Asia, but also by areas of specialization, sectorial or functional. For example, the rankingof the best consulting firms in Finance, IT, etc. The leading firms are under a handkerchief, the gap between Bain, McKinsey and BCG is insignificant. The top 4-25 firms are composed of mastodon consulting firms, such as Deloitte, Accenture, KPMG, as well as less well-known firms. I have dedicated another article to the construction of this type of ranking methodology, not to make you a future expert on Vault, but because this methodology allows you to better understand the spirit and motivation of professional consultants. This is an asset to start a firm’s recruitment process. Why? Because you can use this material to nurture your motivation speech J. The Vault ranking is useful because it gives insight about the major firms: who they are, are they challengers or established, in what court do they play, etc. This allows one to put into perspective the positioning of certain consulting firms, which see themselves as the best of the best, but which do not benefit from this recognition in the sector! It can also detect companies with strong potential for your career. 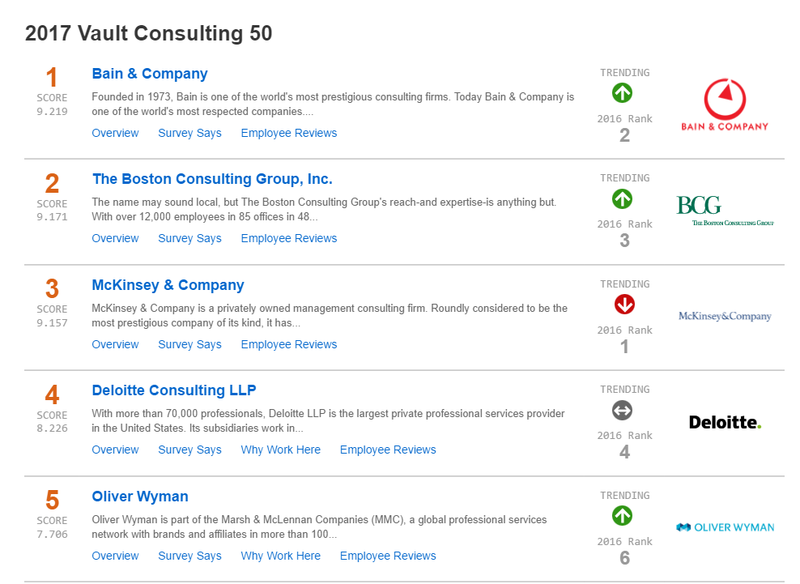 Because right now, it is a great recognition for any firm to appear the Top 50 consulting firms on Vault. I do not say that the standards of excellence can be evaluated by such rankings, but in the consulting sector, the Vault rankings are a little like the classification of the Financial Times for the MBA. You can criticize, especially when one is not well-rated, but the ranking is respected or at least taken into account in the profession. In this regard, I was present when a Financial Times journalist arrived in an institution assess their MBA program, for establishing its ranking. I can tell you that these people are taken seriously by the institutions. Thanks to the Vault rankings, you can identify of the best recognized consulting firms. Now these rankings are also self-sustaining. It’s like the covers of magazines; they also need to attract the interest of readers. This is why the ranking of the top-tier firms changes often, just to say “The best consulting firm in the world is not McKinsey. Wow! Not possible! Looks at the Vault rankings!” We find this phenomenon in the rankings of best business schools, best MBA, etc. The first moving to the second or third position makes the buzz. What is clear, on the other hand, in consulting, is the real gap between the top three companies and the rest of the firms. At this level, the ranking is representative of the hierarchy between consulting firms. How A Consulting Firms Ranking is Typically Built?